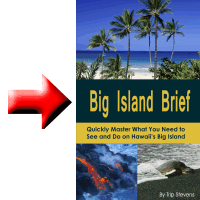 You can visit the Big Island at almost any time of the year and have a great vacation. If the timing of your vacation is fixed, you may have limited choice about when to visit the Big Island. But if you are flexible about when you are able to take your vacation, you have relative freedom to choose the time of year that is best for you. In that case, the easiest way to decide when to go might be to first eliminate the less desirable times. One big factor is how busy the island is throughout the year. The two busiest weeks on the Big Island are Christmas week and Easter Week. Of the two, Easter week is the busiest due to the queen mother of all Hula Events, the Merrie Monarch Hula Festival. Aside from these two weeks, the flow of visitors to the Big Island is fairly consistent and evenly spread across the year. 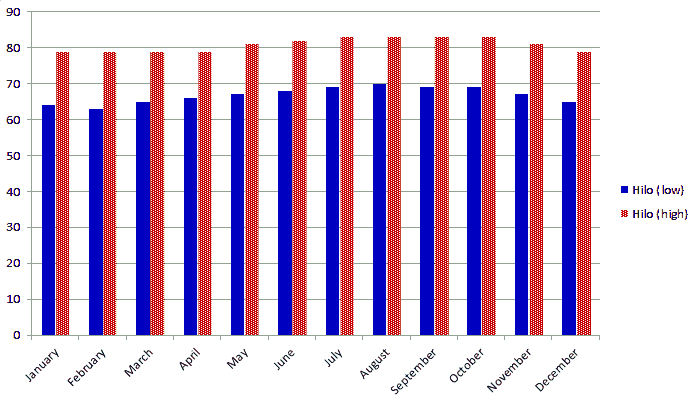 The chart below shows the number of visitors to the island on a monthly basis. 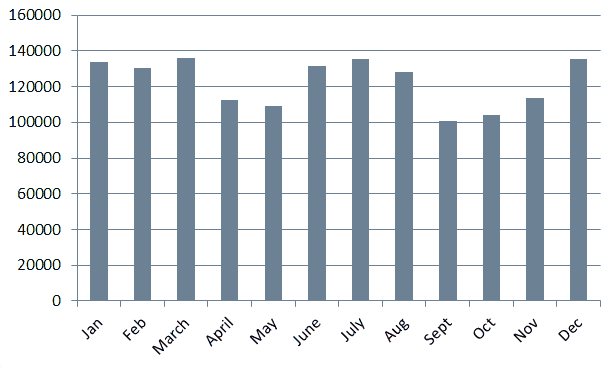 You can see that the number of monthly visitors does not fluctuate wildly. In fact, if you took out the extra visitors during the week of Christmas in December, the monthly numbers would vary even less. According to the chart, September has the fewest visitors. But the next factor to take into consideration is the weather, including average rainfall and temperatures. The chart directly below shows the monthly rainfall for the cities of Hilo and Kona. If you will be spending a lot of time in Hilo, March and November might be the months to avoid. If the bulk of your time will be spent in Kona, then rain is probably not a factor. The next chart (below) shows the monthly temperatures for the city of Hilo. Kona’s temperatures are typically three to four degrees warmer than those in Hilo. Just like all the other Hawaiian Islands, the temperatures on the coast run in the seventies and low eighties during the day. Taking into account the factors just discussed, as well as the activities you’d like to include in your visit, it should be fairly easy to decide on the best time for your visit. However, in general, you can visit the Big Island at almost any time and meet with favorable conditions.